The Writing Bug: Good Idea Gone, Gone Gone! Good Idea Gone, Gone Gone! Wham! A great idea hits you. You jot down some notes, but are interrupted by some critical thing. Dog, cat, teenager, laundry, sleep….you know, important stuff. Any writers out there know the feeling. Upon returning to your notes, you realize you’ve lost it. The Beard bought me a voice recorder. It sits on my bedside table. I think I’ve used it once or twice. In fact, I better go check it for story ideas. I’ve written two or three-word reminders which upon later scrutiny ends up being gobbledygook. Writing the bones of a story idea in the middle of the night results in sleepless mulling. Even if I accept the loss of sleep, other stories try to crowd into the space. It’s a dilemma. This week I awoke with a great story idea. At least, it seemed like a great idea at three in the morning. I grabbed the phone and tapped my thumbs double time. 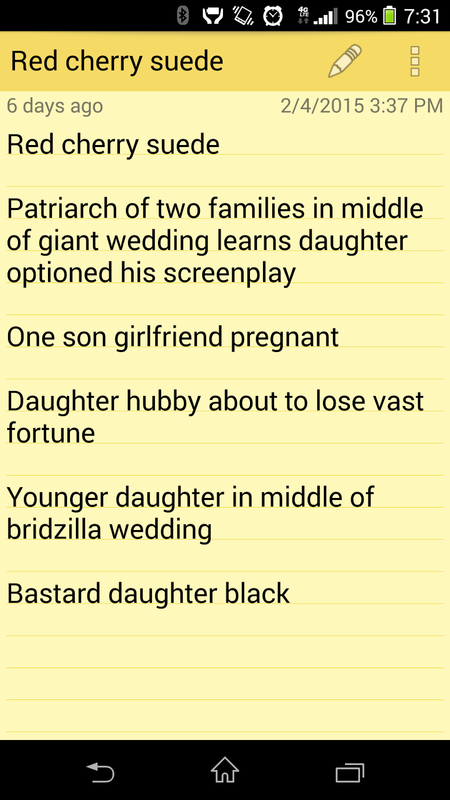 Character list, the basic plot, the opening scene, and sort of a title….all saved on my sticky note app. Looking over my notes today, I’ve got nothing. I can’t call to mind the overarching concept tying the scattershot together. This is incredibly frustrating. An abundance of ideas and not enough time to devote to developing them….wah, wah, wah, what a terrible problem to have as a writer. It seems a huge waste of creativity. I experience the same feeling when walking into the laundry room for something and forgetting why I went there five times in a row. Argh! I also love to write, so I see these lost ideas as opportunities lost. Granted, I’m less than ten chapters from finishing a sequel. I’m sorting through editor notes on a rewrite. I have three other novels started and a full outline of a fourth. It all boils down to time. In high school, I planned on being a novelist. I imagined, at the time, living in a little two bedroom cottage single without children. I still believe a garden shed or container office would remove me from my commotion filled domicile. No matter how many pintrest pins I place for the Beard, he doesn’t seem to keen on starting construction anytime soon. Of course, it’ll have retinal scan door locks. Time and a clear head. Time, a clear head, a clean house, and no teenagers asking what’s for dinner. This happens to me so often. Even though I have more than enough to write about, I still regret the ones that got away! Oh, yeah! I've tried jotting things down, but they become like dreams and the important "feeling" of it drifts away. And about interruptions... It's taken time, but my husband now tries to read my face before he starts to talk to me. Am I reading something, making a comment, or writing a poem? He used to just come into the room talking, then he began coming in and asking me what I was doing, or was it okay to talk. Neither of those is different in my eyes. Now he stands there and waits. That's not a lot different either. At our small home on the ocean that we are renovating, he is building me a writing room over the garage, overlooking the ocean and feet away from the house. So excited to see how it works out for me! Be very careful about those "wishes," or be very specific how you want them to come true. I kept wishing for more reading and writing time and now I have all I want because I'm sitting here with a hot pink cast on my foot for the next four weeks. Patricia...I feel you! I was in the same position last February and couldn't get a thing done. Rest and heal! It takes a lot of energy! Donna...what a joy to have writing space and with an ocean view!